This is your chance to be included in the Poly Drive PTA directory for 2014-15. Use this Poly Drive PTA directory form, and turn it into the school (PTA mailbox) or scan your completed form and e-mail it to polydrivepta@gmail.com by Sept. 22. This directory provides contact information for Poly Drive families. It is voluntary; please provide the information you are comfortable with sharing. On this same form, you can sign up to support Poly Drive PTA by becoming a member AND selecting volunteer opportunities. Dues collected from PTA members ($18/year) go toward the many enrichment activities and initiatives sponsored by the Poly Drive PTA. 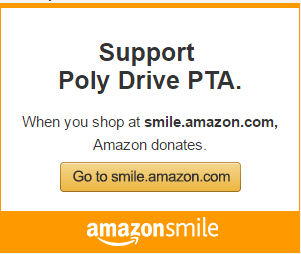 The Poly Drive PTA is dedicated to enriching the lives of all students at Poly Drive and all families are welcome and encouraged to participate in this effort. Together we achieve more for our children. A big thank you to all of the Poly Drive families and staff who turned in their PTA membership, directory and volunteer sign ups. Your involvement helps our school in so many ways! Over ninety families returned their forms to school by Sept. 4, the deadline to be entered into a drawing to win one of ten prizes. Joining PTA does not require you to volunteer your time, though it is always appreciated. Scholarships to cover dues are also available for families in need. Sign up forms are available in the hall by Ms. Vicki’s office at Poly Drive. A friendly reminder that children are not allowed to wear their costumes at school. Friday, Oct. 25 is Spirit Day so find those Poly shirts now. Friday, Oct. 25 is also Bike Fix Day, after school. Derek Cromwell from the Spoke Shop will have the Bike Trailer to tune up any students’ bicycles.